After another disappointing playoff finish, the Washington Capitals elected to keep the status quo, leaving the roster relevantly unchanged. The hope was that the Capitals would once again dominate the regular season. But early on, chemistry was surprisingly a problem, as was its offense, one of Washington’s biggest strengths. 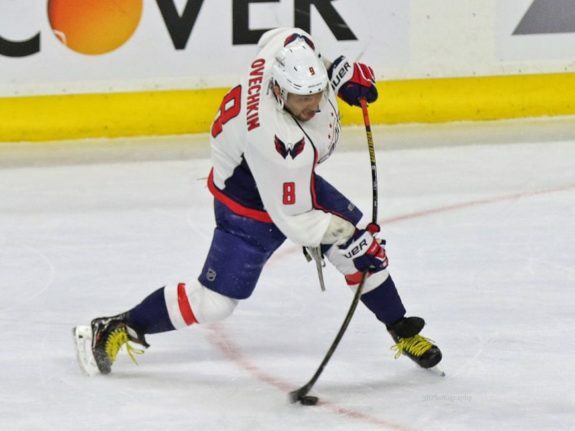 It was an up-and-down first quarter for Alex Ovechkin, Evgeny Kuznetsov and Nicklas Backstrom, but coach Barry Trotz managed to fix the team’s goal-scoring struggles with one simple solution. The Capitals signed veteran wing Justin Williams last summer to help provide experience come playoff time. Williams won a pair of Stanley Cups and a Conn Smythe Trophy during his seven seasons with the Los Angeles Kings. But lately, the 35-year-old is providing a lot more than just experience. Trotz moved Williams up to the top line alongside Ovechkin and Kuznetsov on Dec. 7 against the Boston Bruins. It’s probably not a coincidence that Washington won five of its last six games since the change. Williams has taken full advantage of his opportunity to play with Ovechkin. He has seven goals and 11 points this season, and five of his markers and six of his points were scored in the six games since he moved up to the top line. Ovechkin started the season strongly, but he cooled off after posting a hat trick versus St. Louis on Nov. 23. He failed to score over the next seven games and, including a hat trick, Ovechkin had five goals in a 15-game span. By no means is that a terrible pace, but over the course of an entire season, averaging five scores in 15 games would equate to a 27-goal season. That would be un-Ovechkin-like. He has found his scoring touch again since Williams joined his line, with a pair of goals and four points in the last four games. Granted, three of his four points, including both scores, have come on the power play, but it’s hard to deny Williams’ impact. Ovechkin gained confidence at even strength since the line change, which has translated to a more aggressive player on the power play. The lineup change has also had an impact on Kuznetsov. He hasn’t scored since Nov. 23, but has seven assists in his last six games. The question now is whether or not this switch will be a long-term change. The days of Williams averaging over 18 minutes of ice time per game are over, so there must be doubts about whether he can play top forward minutes on a nightly basis. Trotz has done his best to manage the 35-year-old’s ice time, and as a result, Williams is averaging 15:56 per game, which is the second-lowest mark of his career. Through the first 30 games last season, Williams averaged 16:48 per game, almost a full minute more than his average playing time in 2016-17. In three of his last seven games, Williams has played at least 16:55 per game, so his playing time is increasing. But, his average ice time has stayed the same because he played under 14 minutes in two other contests. Last Friday against Carolina, Trotz was able to limit Williams’ playing time to 13:11 by keeping him off the power play entirely. Most of the time, Washington will need Williams on the man advantage, but the Capitals have other playmakers who can give Williams a rest if he needs it. Keeping him healthy and on the top unit should be Trotz’s top priority. Another factor working in Williams’ favor is that the minutes for almost all of Washington’s top forwards has decreased this season. In each of the last four seasons, Ovechkin has averaged at least 20 minutes per game; over his entire career, he’s only finished one season with an average ice time under 20:00. In 2016-17, Ovechkin is averaging 18:44 per game. During the team’s recent six-game winning streak, he averaged just 18:10 per contest. There has been a significant decrease in playing time for Backstrom and Oshie as well. Washington won the Presidents’ Trophy last season, but the team wasn’t able to capture the real prize. 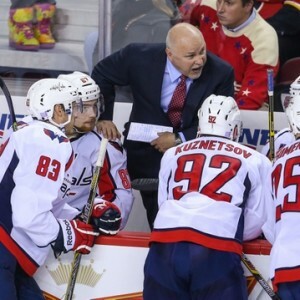 Trotz has smartly realized that dominating the league as his team did a season ago isn’t the ultimate goal. Keeping his team fresh and ready to hit its stride in March and April is better. It would be naïve to suggest that Williams is the sole reason for Washington’s recent hot streak, as it always takes more than one player to win hockey games. But clearly, moving him to the top line has been one of the team’s main driving forces of late. Despite his age and the desire to limit his minutes, Williams should stay on the top unit.